Creating a Professional Services Marketing Masterpiece! Is your professional services firm generating A-list, sales-ready leads? Learn how – and start painting your business in the right light! 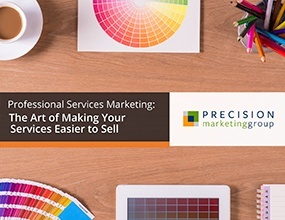 Our free eBook Professional Services Marketing: The Art of Making Your Services Easier to Sell is designed to help professional services marketers build and customize strategies that yield real business results. Making the most of relationship marketing… and more! Fill out the form to download your free eBook!